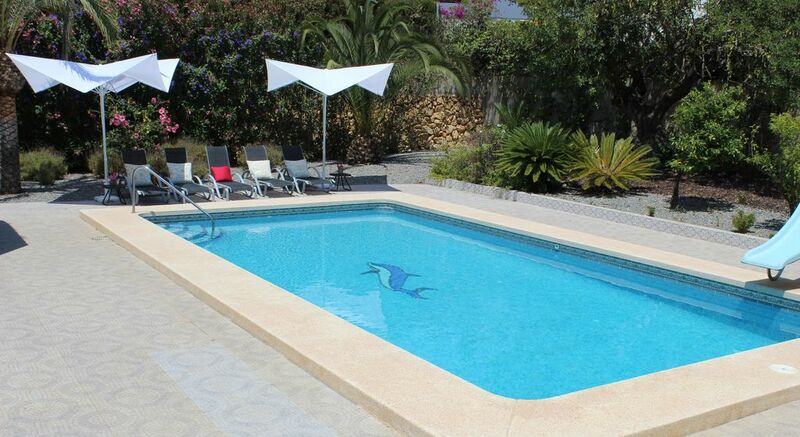 Villa Kasa, WIFI, 5 bedrooms - 3 bathrooms near Alfaz del Pi, Albir and Altea. Kasa villa, suitable for 2 families with children, lies below a mountain of 1000 m2 and has its own private pool 5x10 mtr in a quiet area in the Carbonera area. The garden is fully fenced by a wall so that children can walk and play freely. The villa has a spacious modern kitchen, one bedroom with a kingsize bed, 2 bedroom with a queensize bed and 2 bedrooms with 2 single beds and all bedrooms are equipped with bed linen. There are three bathrooms with shower and toilet, a living room with fireplace, satellite TV with Dutch and many foreign channels, WiFi Internet, a kitchen with electric hob, oven, microwave, refrigerator, coffee maker, iron and ironing board, a washing machine, a large covered terrace adjoining the living room and kitchen. The house is fitted with fly screens. Furthermore, a large terrace in the sun or shade, patio furniture and sun loungers, covered barbecue area, an enclosed garden and ample parking on site. The villa has central heating to allow a stay during wintertime. Additional persons / beds can be requested (max 12). Activities in the vicinity: In this beautiful green, hilly and wooded area surrounded by the many orange and lemon plantations you will find everything that makes Spain so attractive: Sun, sea, and beach fun and peace and quiet. Altea, Benidorm, Benissa, Javea, Denia, Oliva, Mutxamel, San Juan de Alicante, with tennis, hiking, biking, go-karting, water sports, etc. For young and old are the theme parks Terra Mitica, Terra Natura, Mundomar and Aqualandia and a vibrant nightlife. For lovers of car and motorbike tours for walkers, cyclists and climbers, the beautiful inland provides spectacular scenery. The enthousiast can find daily and weekly (flea) markets. There are also plenty of excursions, including jeep, quad bike, kayak and jet ski tours, Safari Park Aitana, karting, helicopter flights, Benidorm Palace, museums, medieval battles, the palm forest of Elche, boat trips, waterfall Fuentes de Algar near Guadalest. 7 Golf courses in the vicinity: Thanks to the sunny and temperate climate of the Costa Blanca, the true lovers of golf are at the perfect surrounding. In this region people have never heard of 'winter greens'. Play golf year-round and enjoy the many wonderful golf courses in the region, a golfers paradise! Winter adaptation bedrooms: Only the upper floor has central heating: the lower floor has two movable heaters. For a winter stay it is possible to place one double bed in one of the bedrooms on the upper floor. The upper floor then has two bedrooms with a double bed and one bedroom with two single beds. All Dutch channels present, Discovery, Animal Planet, NGC. Nickelodeon, Comedy Central, MTV (dance and rock), Eurosport, VH1, BBC World, CNN, CNBC, Bloomberg, Sky News, France. Euronews, ZDF (neo-kultur), 3Sat, RTL (2), Super RTL, Sat 1, Kabel eins, VOX, Kika, Eins extra. Eins Plus. Welcome package: At arrival a welcome package is provided, with a deck of cards, Yathzee dice, Coffee with milk and sugar, trash bags, paper towels, cooled water, tea lights, salt and pepper, dish towel and of course a small gift. WIFI: Use of (wireless) ADSL internet is free. House has central heating except the lower floor. Consumption of gas in the period October until April is not included in the rental price. Including cover (period from October to April). Size 10 x 5 meters swimming pool with slide. Everything you need is in the house. Supermercardo not too far away. Beach is only 25 minutes drive(calpe , playa de la fossa, great!) Anytime again! Zeker aan te raden. Alles is aanwezig en zeker het zwembad is geweldig. Super leuk huis. Gezellige plaatsjes in de buurt (wel auto nodig) met heerlijke restaurantjes. Hebben met 8 dames voor de vierde keer van een heerlijke vakantie genoten in vila Kasa. Huis is van alle gemakken voorzien. Zeer gezellige inrichting, schoon! !, prima bedden en een heerlijk zwembad in een riante tuin. Vanuit de keuken kom je op een gezellig terras waar je heerlijk kan ontbijten. Wij kunnen niet wachten om terug te gaan. Fijne en rustig gelegen vakantiewoning. Door de aparte boven- en benedenwoning heeft ieder toch zijn privacy als daar behoefte aan is. De tuin, veilig af te sluiten voor de kinderen, is ruim en het zwembad is comfortabel en groot! BBQ plek in de tuin ligt fijn in de schaduw. Bakker en supermarkt is binnen tien minuten bereikbaar. Kortom, fijne plek om vakantie te vieren en kom er zeker terug. We hebben een heerlijke vakantie gehad! Prima slaapkamers, badkamers en woonkamer. De tuin is prachtig en heeft meerdere zitjes, een fijn zwembad en ligbedden. Meer heb je eigenlijk niet nodig. Goede uitvalsbasis om de stadjes in de omgeving te verkennen. The spacious villa is accessible from Alicante airport in 35 minutes by car and is located in Alfaz de Pi near the modern Mediterranean villages Altea, Calpe, Moraira, Albir, Javea, Denia where time has stood still, with endless beaches of golden sand, calm and clear waters and lush coastline with dramatic cliffs and coves. Not far from the coast, the amazing salt mines located in a unique natural environment, as well as forests and mountains of great beauty can be found. The Costa Blanca enjoys over 300 days of sunshine per year, with an average annual temperature of 17 degrees. Within 15-30 minutes by car a large water slide park, Terra Mitica amusement park and several golf resorts can be found. Alicante Golf is situated at the foot of the Sierra Grossa, north of Alicante and close to the beach of San Juan on the Mediterranean Sea. It is the only 18 hole par 72 course on the Iberian Peninsula, consisting of six par 3, six par 4 and six par 5 holes. Plenty of birdie opportunities so, but a lot of variety: the first nor the second nine see two consecutive holes that have the same par. On the fourteenth hole is a very special obstacle. To the green, then set about the ruin of the 'Villa Ferrer' around, a Roman villa from the year 1 BC was discovered that the construction of the road.